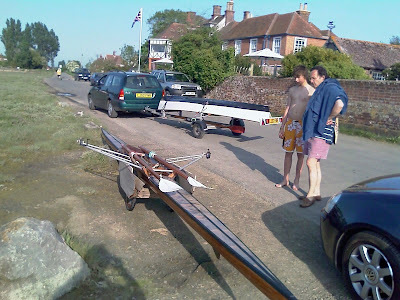 I came across a bloke in a shell at Bosham today, the first time I have seen another sliding seat rowing boat on Chichester Harbour, though lots of people have told me they have friends who do it. It is an old shell from Putney, and the owner (on the right) keeps it in his house close to the foreshore at Bosham. He has a trolley made from bicycle wheels so he can just trail it out whenever the weather permits. Why don't more people do that? 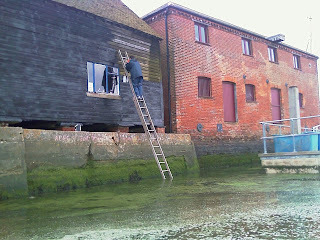 And here's a picture of a guy painting the side of the boat shed at Dell Quay, taken a couple of weeks ago. It's the marine equivalent of painting yourself into a corner - the tide has come in round the bottom of his ladder and he can't get down without getting his feet wet. That photo of the man on the ladder made my day!